Sunset Beach on Treasure Island is located in a more residential community, allowing you to escape the major crowds of Clearwater Beach. 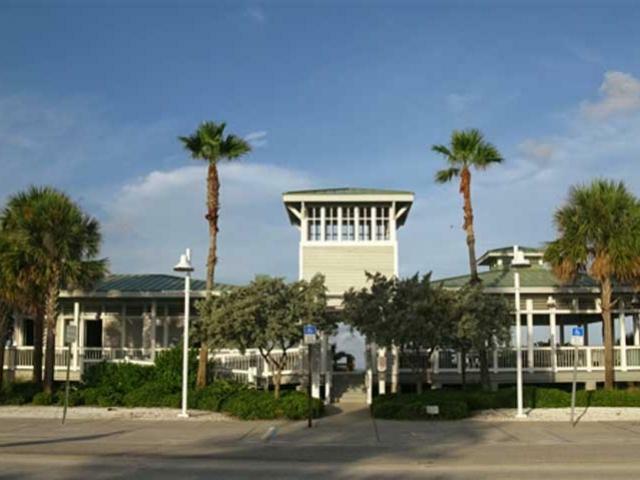 Sunset Beach is known for its views of the jetty, the presence of sea oats, its availability to rent the Sunset Beach Pavilion, and being open to the LGBT community. Escape to a Jimmy buffet song and enjoy a slice of paradise. With the tropical feel of Key West but only a 20 mile drive from the St. Pete-Clearwater International Airport, traveling here has never been easier. If you rent the Sunset Beach Wedding Pavilion, we can have your wedding ceremony set up behind it on the beach. 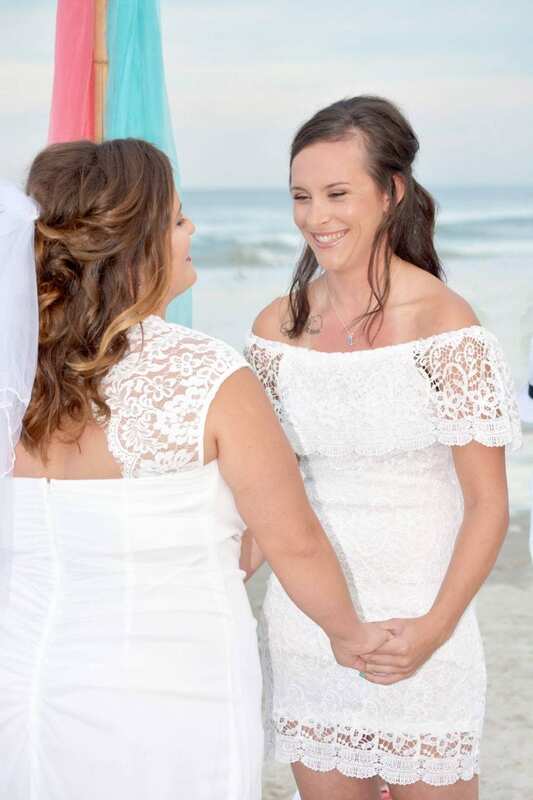 If you are having your reception elsewhere, the south end of the public beach is more secluded and has beautiful views of the jetty, making it an ideal choice for your Florida wedding. The Sunset Beach Pavilion is an ideal place to have your Florida beach wedding ceremony. The pavilion is affordable to rent, includes 6 picnic tables, a power outlet, and you are allowed to bring in food and alcohol. We love the idea of having an intimate and affordable beach wedding reception here. We can setup our Sunset beach wedding ceremony on the beach by your reception. The pavilion has a walkway leading down the reception for easy access for you and your guests. Consider bringing in some coolers with drinks, a beautifully decorated wedding cake from Publix, and having a local restaurant deliver food. If you are trying to keep it budget friendly and easy, Publix also has fruit/cheese trays, sandwich platters, chicken finger platters and more. You can do an easy dinner, drinks, cake and bring a speaker for music. You won’t need much decorations as you will have the beautiful Gulf as your backdrop. Your guests will love the laid back atmosphere while they watch the sunset and truly soak in their vacation at your reception, and you will love the price! This pavilion rental is good for 50 people, so all of our Sunset Beach wedding packages are a great choice. 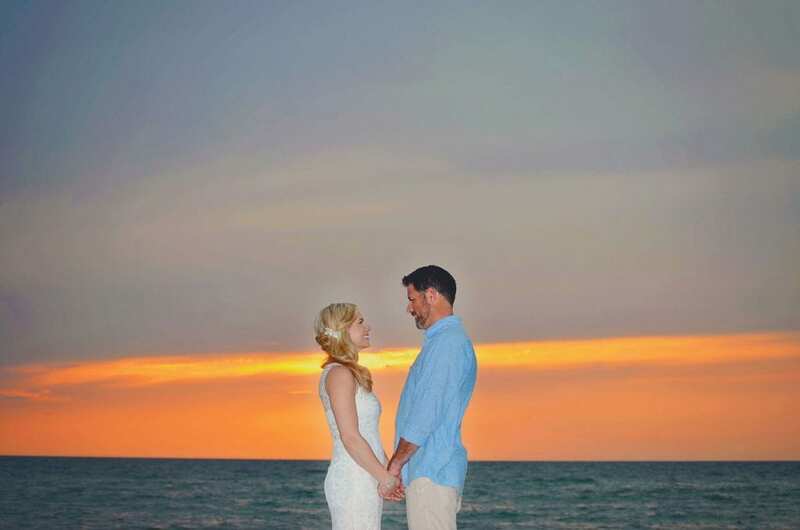 The most common request from couples is the location for a private Florida beach wedding ceremony. Well look no further and start planning your private Treasure Island Beach wedding ceremony in Clearwater at the Lions Club. The Lions Club is located on the North side of Sunset Beach and can hold up to 120 people. Not only is the Lions Club a private beach for your wedding ceremony, but it also has a bridal party changing room, a full kitchen and bar, on site manager and free parking with rental. You can also save by bringing in your own food and alcohol when you purchase proper insurance. 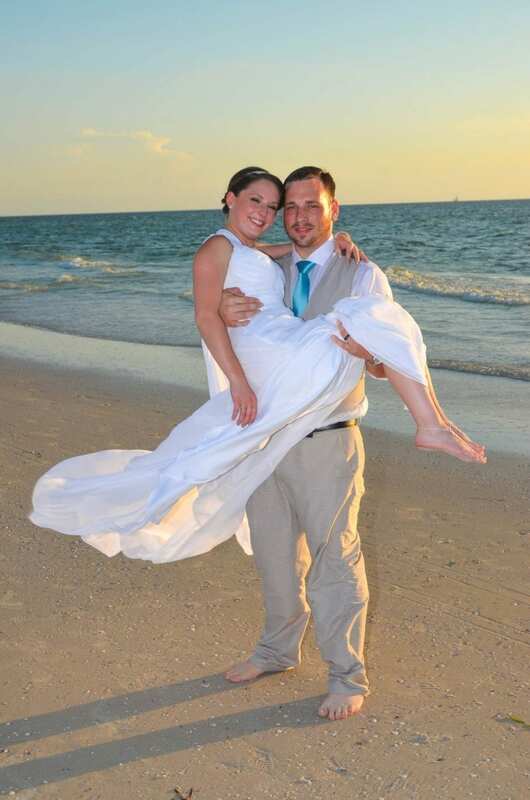 If you are looking for an all-inclusive Florida beach wedding, this is your ideal location. With a Gulf beach wedding and reception, your views will be endless and you and your guests will leave your wedding in awe.